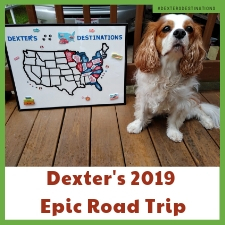 Dexter, his BFF Levi, Chris and I were once again heading to the dog-friendly state of Indiana. 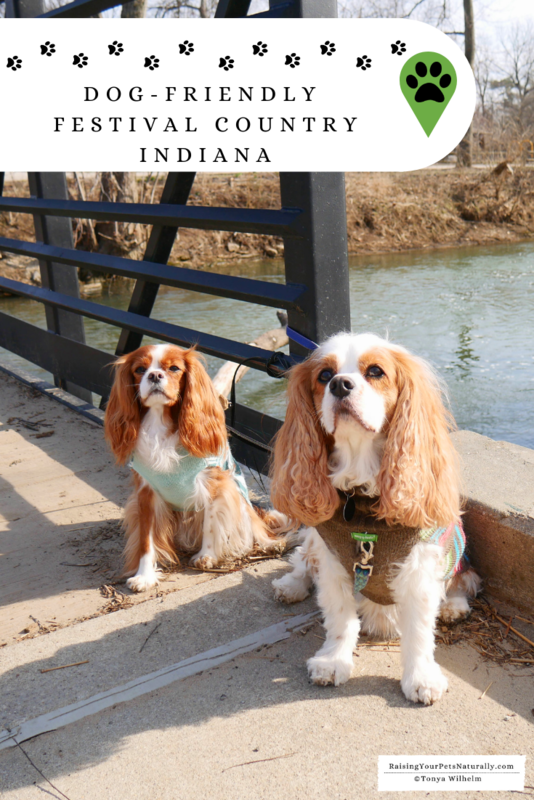 We have been taking pet-friendly road trips to Indiana for a few years and love what Indy has to offer dog parents. This time around, we were heading to Festival Country, Indiana, just south of Indy. 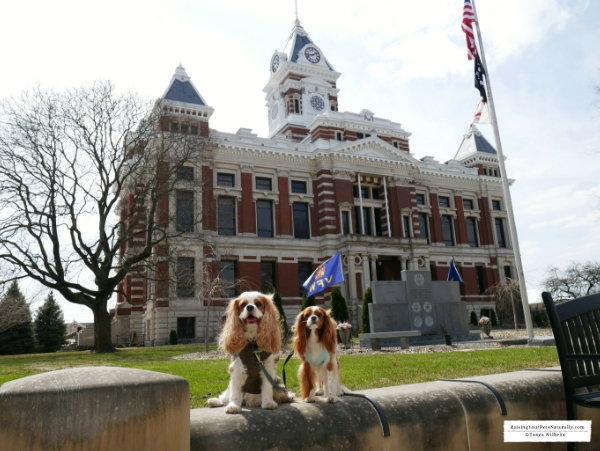 The buzz around town was that Festival Country, Indiana offers a lot of great dog-friendly restaurants, hotels, dog parks, and fun, quirky murals and photo opportunities. That’s all we needed to know before we were ready to pack our dog-travel gear for a weekend of fun. First up, was a visit to Franklin, Indiana. This charming Midwest town was a great first stop. The atmosphere of Franklin was very warm and welcoming. The downtown streets are very traditional, with locally owned shops, restaurants, and coffeehouses. 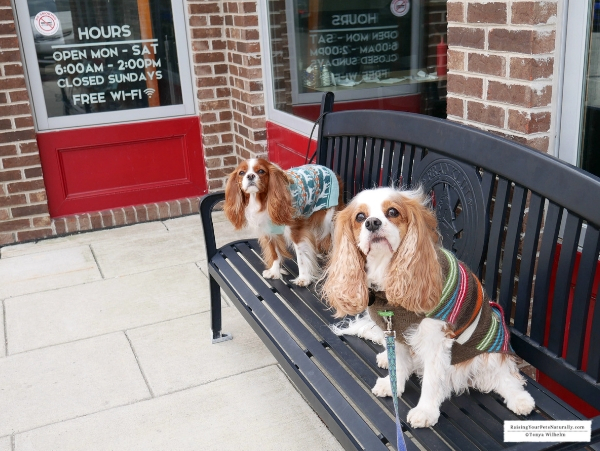 Dexter and Levi enjoyed walking Main Street and smelling all the new scents. 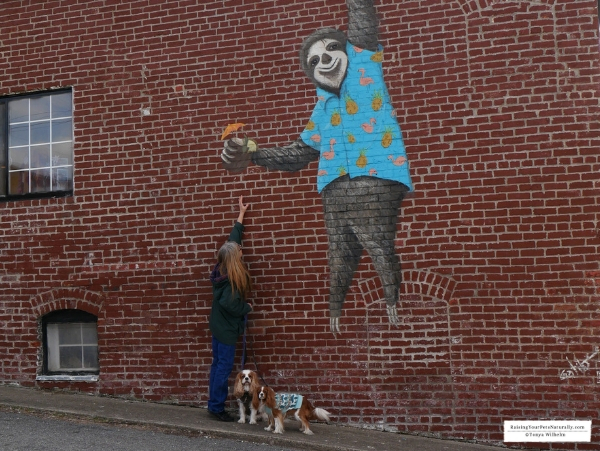 We were sure to visit some of the delightful murals throughout Franklin. 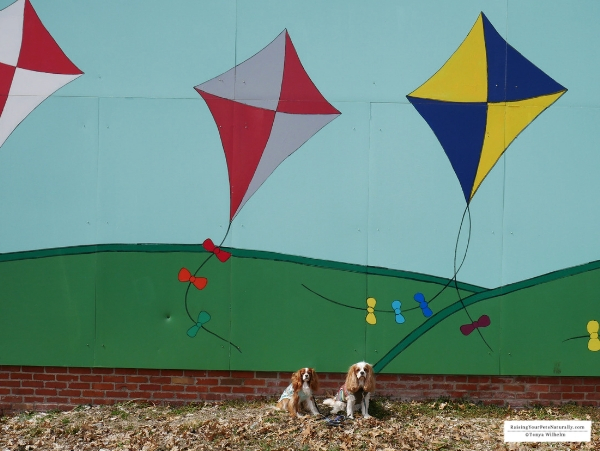 These murals can be found on the buildings throughout Johnson County. Following a few photo ops, we headed to Province Park for a stroll. 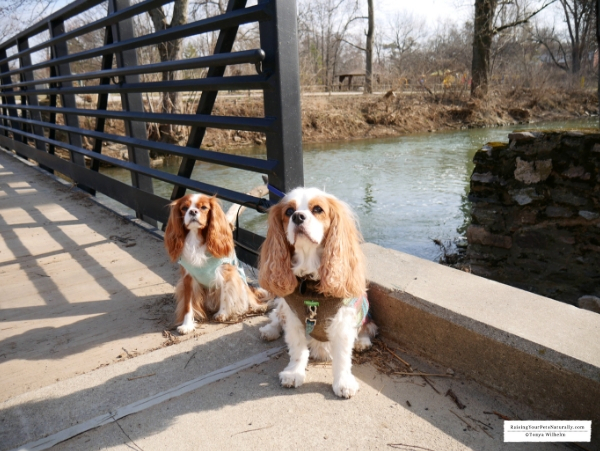 Dexter and Levi enjoyed walking the paved walk and really enjoyed watching the geese on the stream! They were quite active. Province Park also includes Province Dog Park. It looked like a well-kept, large park with lots of fun agility equipment to play on. A membership with a key code is required, so contact the city prior to your trip if you would like to play off-leash. By this time, we were ready for some tasty food. 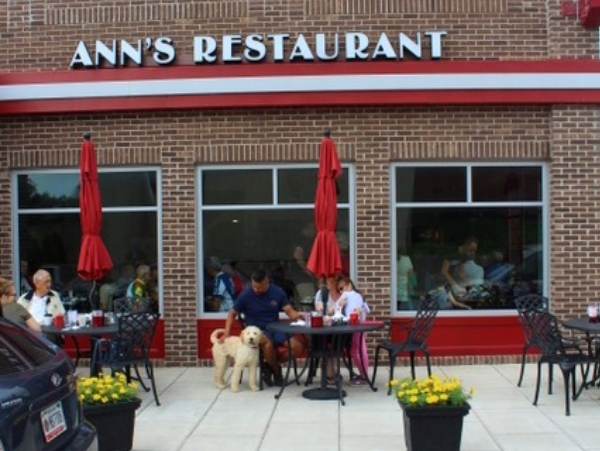 We headed to Ann’s Restaurant, which offers dog-friendly tables in the warmer months. We were a bit early in the season and found a few picnic tables in the back. 🙂 Ann’s Restaurant doesn’t just offer scrumptious food, they donate their profits to help the community. How cool is that? They were bustling! That’s always a good sign when ordering food. I ordered the avocado turkey melt. This sandwich was light, refreshing, and really hit the spot. 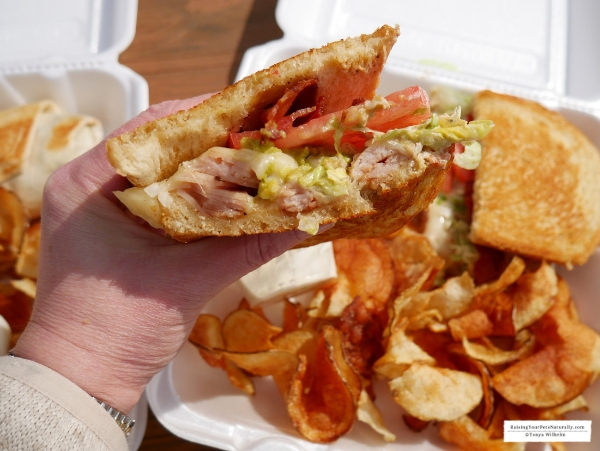 This melt was filled with grilled turkey, Swiss cheese, bacon, avocado, lettuce, and tomatoes and served on grilled sourdough bread. I requested the spicy ranch on the side. Chris went for the veggie wrap. 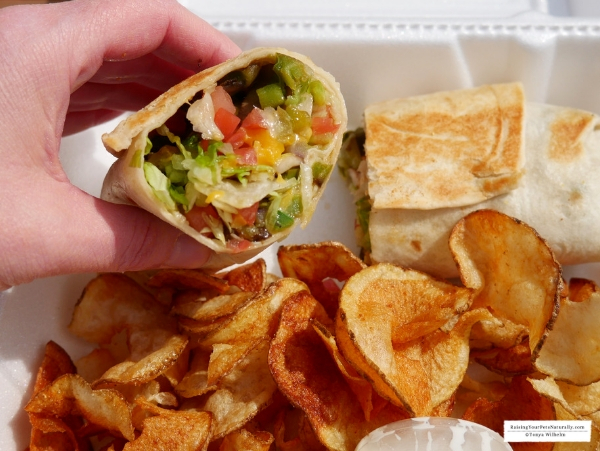 This wrap was chock full of grilled onions, green peppers, tomatoes, mushrooms, lettuce, tomatoes, and cheddar cheese. We both went for the homemade crispy potato chips. After lunch, we headed up to Greenwood, Indiana for something sweet to take back to our hotel room. The Flying Cupcake was calling our name! The Flying Cupcake offers a huge selection of, you guessed it, cupcakes. But, not just cupcakes. They also bake and serve cookies, bars, and brownies. I’m a huge sweet and chocolate lover, so choosing was really hard. They do not offer outside seating at this time. Chris and I both ordered the salted chocolate caramel cupcake. 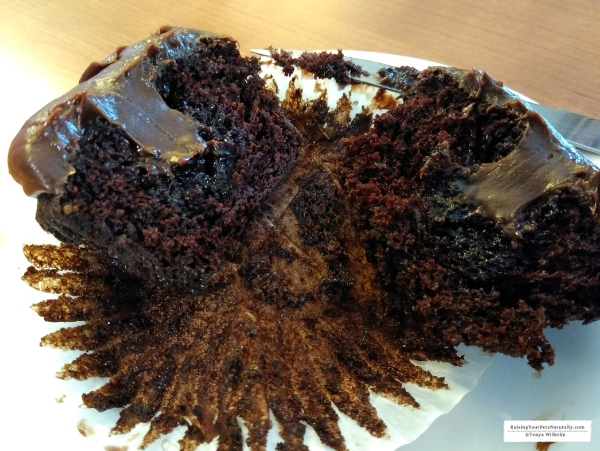 A classic chocolate cupcake filled with caramel topped with a rich chocolate-caramel ganache. These decadent cupcakes tasted as good as they sound. We also had to go home with one of their bestsellers, the Red Velvet Elvis. A dreamy red-velvet cake with chocolate chunks and topped with cream cheese icing and white chocolate. Yum, is right. But, we couldn’t forget the pups. The boys enjoyed the Flossie Pupcake. This doggie cupcake was made with carrots, peanut butter, flour, honey, and egg. They devoured it and licked their chops clean. No crumbs left behind. 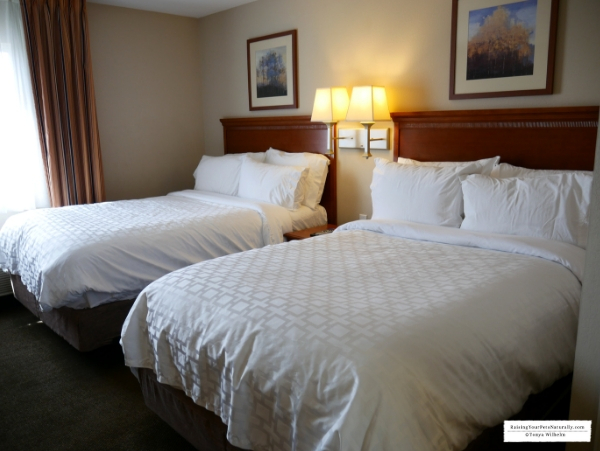 We stayed at the dog-friendly hotel, Candlewood Suites. 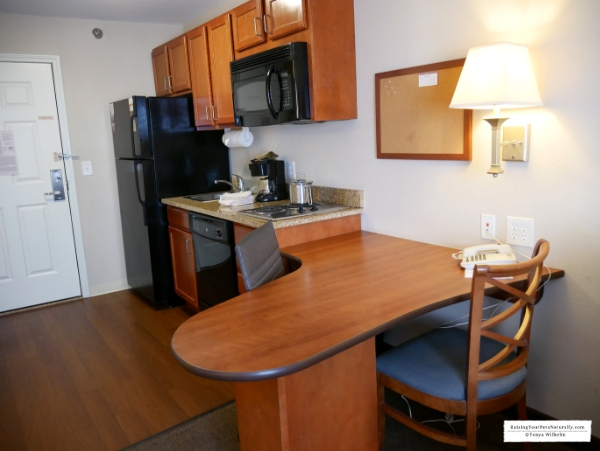 Our spacious suite included a fully equipped kitchen, stove, microwave, toaster, ice maker, dishwasher, cooking utensils, plates, and a full refrigerator. This is really important when I travel with Dexter, since Dexter is on a fresh-food diet. Being able to keep his food cool and having the counter space for food prep is a big selling point for me. Our hotel room also included two very comfortable queen beds that were triple-sheeted for a luxurious night’s rest. The room also had a cozy recliner, a great workspace, lots of electrical outlets, wireless Internet, large flat-screen TV, DVD player, and even DVD rentals. We headed over to Craig Park, which is the largest park in Old Town Greenwood. 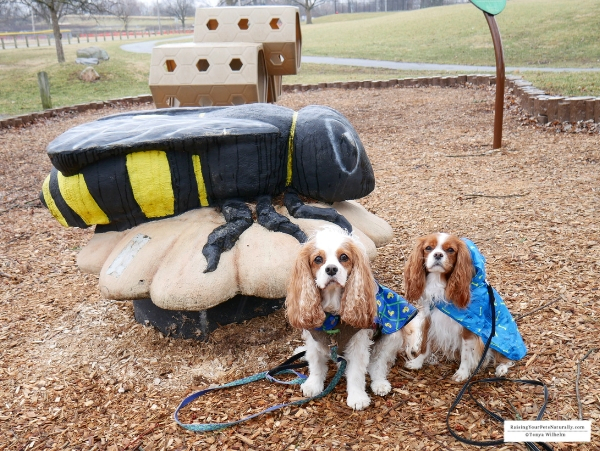 The dogs really enjoyed walking the paved pathways and checking out the kid’s playground. 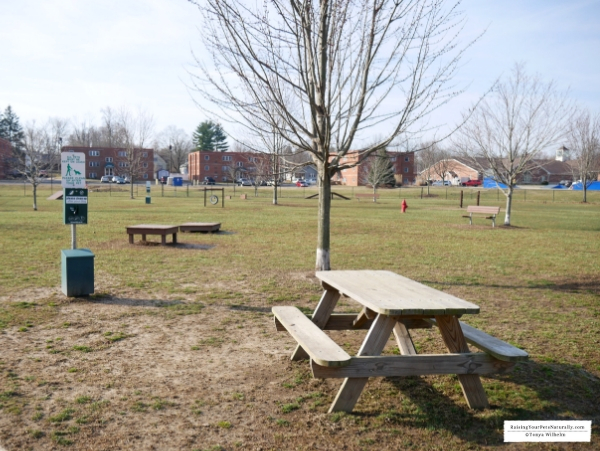 Craig Park is a ten-acre complex, with playgrounds, tennis and volleyball courts, tree-lined paths, and three nature-themed play pockets for kids. It was a very unique park. 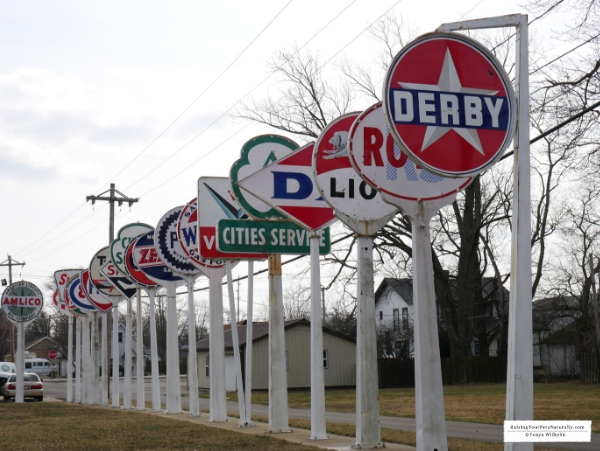 A must see if you find yourself in Greenwood, Indiana. We did get a little rain, so we felt a hot coffee was called for. 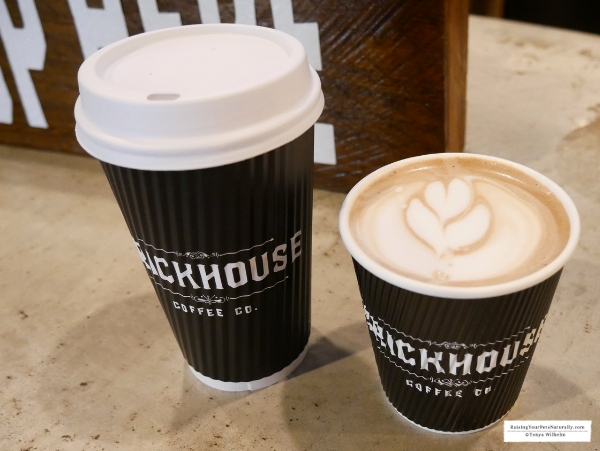 We headed to Brickhouse Coffee Co. for something hot to go. They do not currently offer outside seating, but they are hoping to add outside seats in the near future. This Roastery and Crafthouse sources only direct trade coffees. 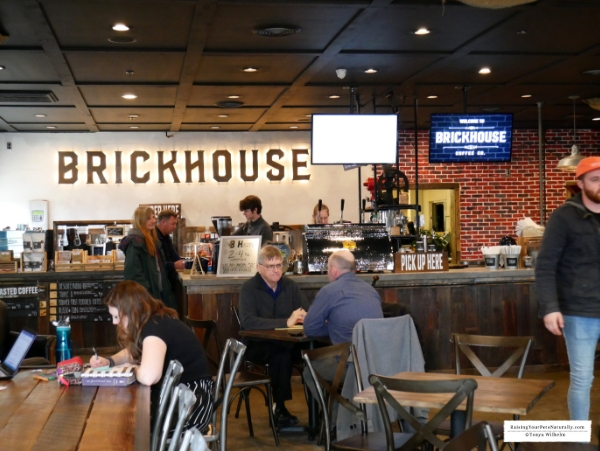 Brickhouse Coffee Co. ensures farmers earn their fair share in their “Farmer First” initiative. The baristas were great at helping us choose our craft coffee. The atmosphere was friendly and inviting. Our freshly brewed coffees hit the spot! We did a little more sightseeing before heading to the Stacked Pickle in Greenwood, Indiana. 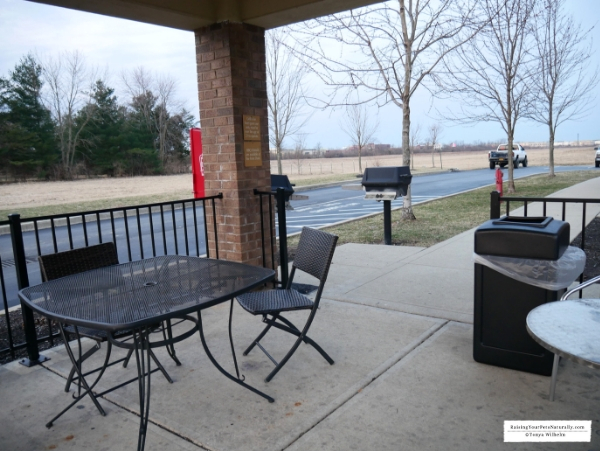 They offer a covered outside patio that is dog-friendly. Unfortunately, we were a bit too early in the season, so we ordered our food to go. We had to try their fried pickles. I’d never had a fried pickle, so this was going to be a new experience for me. 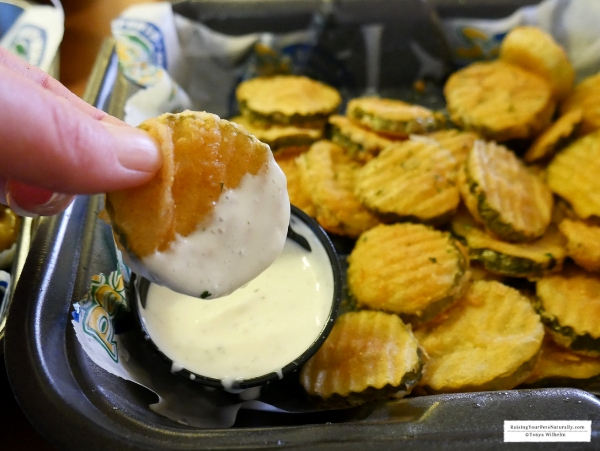 They were hand-breaded pickle chips, served with a side of ranch. I wasn’t sure they would be to my liking, but I was pleasantly surprised. I also ordered up a veggie flatbread. 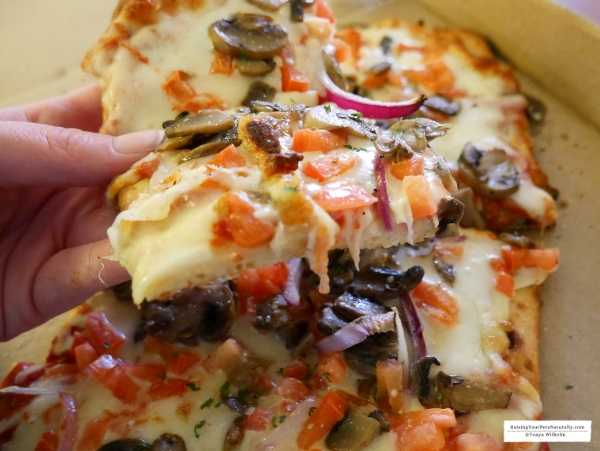 The flatbread was loaded with mushrooms, red onions, and diced tomatoes. I had them hold the black olives. I truly enjoyed this flatbread. It was very light, cheesy, and cooked to perfection. 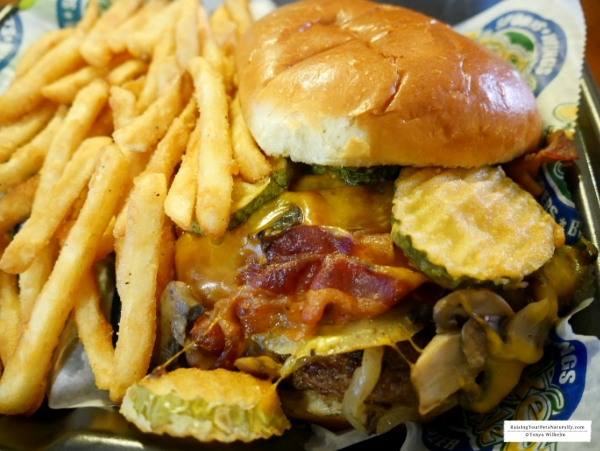 Chris stuck with the theme of the restaurant and ordered the Big Pickle Burger. The burger was stacked with cheddar cheese, bacon, sautéed onions, fried pickles, and mushrooms on a brioche bun. After dinner, we took the pups for a good walk and sniff. Another entertaining day under our belts. We were ready to hit the hay. 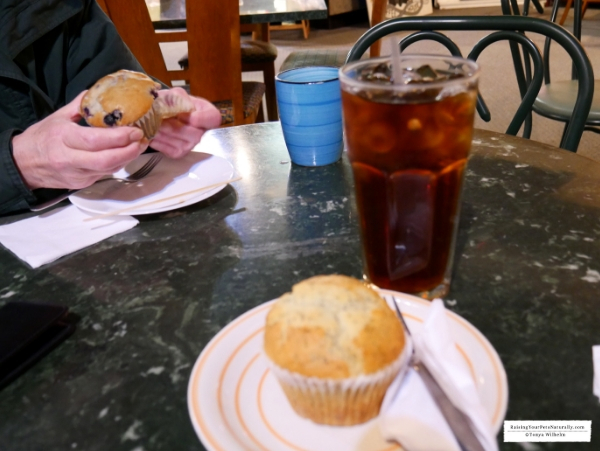 In the morning, we headed to Strange Brew for freshly brewed coffee and muffins. Since the weather was still cool, we left the pups in the car. The oldest coffee shop in Greenwood, Strange Brew is locally owned and roasts their beans onsite. The smell of freshly brewed coffee was amazing. The ambiance was very unique and quirky. I love quirky, so it was right up my alley. The staff was friendly and very helpful when I was asking about their muffin selection. I ordered the poppy seed muffin for breakfast and the apple muffin to go. Chris doubled down with two blueberry muffins. Everything was a hit, but the apple muffin was out of this world. Of, course I didn’t know that until I ate it on the road. I guess I need to plan another road trip to Festival Country and grab a dozen apple muffins from Strange Brew. 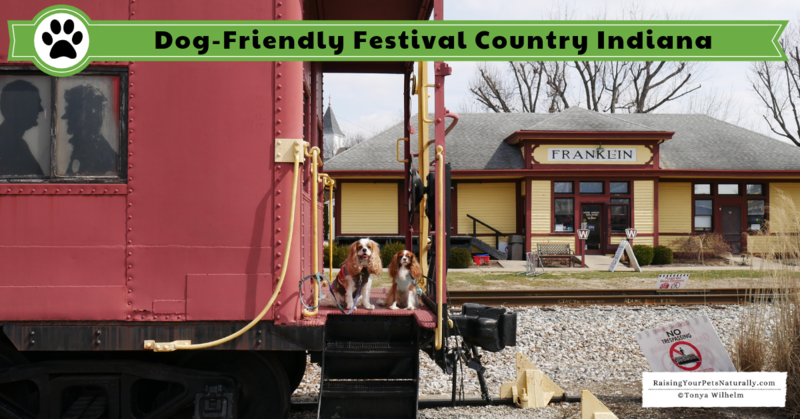 If you are looking for a dog-friendly adventure, I highly recommend visiting Festival Country, Indiana. The community is exceptionally welcoming to travelers and canines alike. 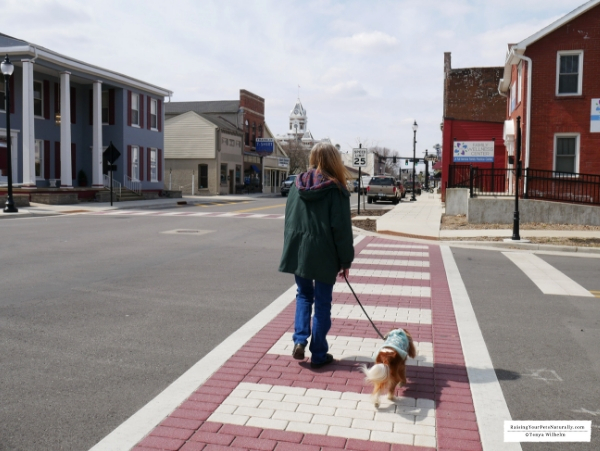 Contact Festival Country, Indiana’s tourism department to help plan your ultimate dog-friendly road trip. As a mom to two little wiener dog children, I thoroughly enjoy your pet-friendly travel posts. Although there are times when I have to travel without my two boys, I much prefer taking trips that allow ALL the family to come along. 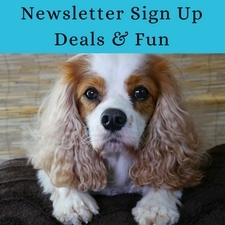 It’s nice to see how much easier it is to create vacations and travel to size for our 4-legged friends. Thanks, Cristina. It takes a little planning, but isn’t that hard and is so worth it! A dog-friendly road trip is one of my bucket list. I can’t image how fun and exciting this must have been, so cool. You must do it! It will be such a great memory. Ok, I am in love with the fact that your two cute pups are such an involved part of your family! Adorable! 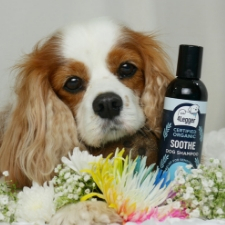 We have a King Charles Cavalier and she is so sweet, they’re the best, most easy going doggies ever! Your dogs are so cute! I am glad that you took them with you on your trip. I also love that Indiana is totally dog-friendly. No more doggy day care centers if we close to there. We can take our fur babies for a road trip too! Thank you. They really are great dogs. Yes, a definite road trip for you to enjoy. What a great spot its hard to find dog friendly places these days. Festival Country Indiana is such a great dog-friendly area. 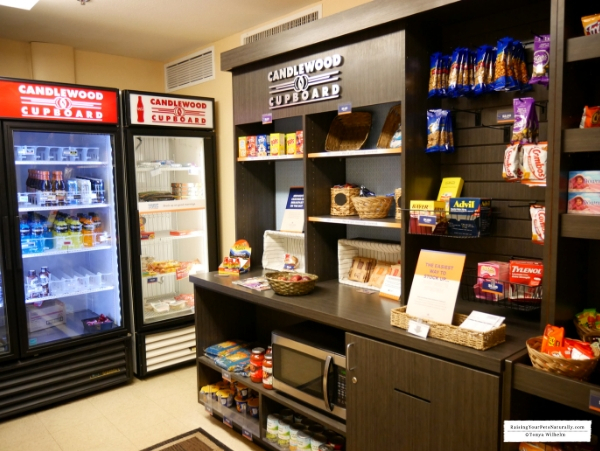 The Candlewood Suites is a great dog-friendly hotel. Thanks, Jackline. Traveling with these boys is always a ton of fun. I only travel with Dexter, never alone. Festival Country sounds like a fantastic place to visit with dogs. It looks like you had a great time. It was a great spot! We had so much fun. Love your pictures – sounds like an amazing trip! Oh an that food looks delicious! Thank you, Natalie. The food was amazing! It’s great that you can take them on trips with you. 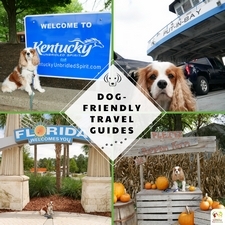 I am glad it seemed that many of the places on your itinerary were dog-friendly! Your pups seemed like they had a good time! Wow. I bet you all had fun. It’s more fun to be with your pets when traveling and enjoy beautiful places together. We had a blast. It’s always more pleasurable to have all the family members enjoying a trip. Furry ones too. You have such a cute dogs and I am sure they are having a lot of fun time visiting that place. I am glad that you found a lot of beautiful places that are dog – friendly I will share this with my cousin as she loves bringing her dog with her every travel. Thank you, Catherine. I appreciate you sharing with your cousin. What a great place to visit. 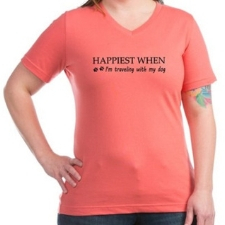 I love this because it will give me a travel experience with my dogs. Glad to hear Romeo! Festival Country Indiana is an amazing destination. So sweet!! I love places that are pet friendly..I hate leaving my little one home. Looks like such a great trip you had and the stops along the way look like so much fun. Thanks, Catherine. It really is fun to choose a destination the dogs will enjoy. Festival Country, Indiana was a hit with the boys! Oh my i love this. You are such an amazing mama to your dogs. And the places they get to explore. Awe, thanks, Irina! It’s easy, they both bring so much joy. We had a great time. The dogs sure do love to explore new places.